Absolute beginner students. These are kinder and 1st graders who do not have any chess experience at the start of the school year. Like learning any other language, children at this age are able to learn chess at an astonishing speed. Many of these students quickly become strong players. Some are able to defeat their parents and older students by the end of the school year. Students in this group move up to Knights after their first year in the club. 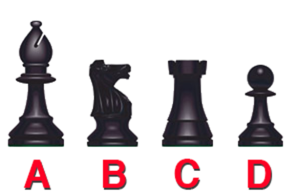 Do you know the names of all the chess pieces? [q] Which piece is called a Rook? [c] A [f] No, that is a Bishop. Remember a Rook looks like a tower of a castle. [c] B [f] No, that is a Knight. Remember a Rook looks like a tower of a castle. [c*] C [f] Correct. Good Job! [c] D [f] No, that is a Pawn. Remember a Rook looks like a tower of a castle. [q] Which piece is called a King? [c*] A [f] Correct. Good Job! 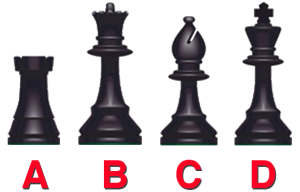 [c] B [f] No, that is a Pawn. Remember a King has a plus shape on top. [c] C [f] No, that is a Knight. Remember a King has a plus shape on top. [c] D [f] No, that is a Queen. Remember a King has a plus shape on top. [q] Which piece is called a Bishop? [c] A [f] No, that is a Rook. Remember a Bishop has a pointy top. [c] B [f] No, that is a Queen. Remember a Bishop has a pointy top. [c*] C [f] Correct. Good Job! [c] D [f] No, that is a King. Remember a Bishop has a pointy top. [q] Which piece is called a Knight? [c] A [f] No, that is a Bishop. Remember a Knight looks like a horse. [c*] B [f] Correct. Good Job! [c] C [f] No, that is Rook. Remember a Knight looks like a horse. [c] D [f] No, that is a Pawn. Remember a Knight looks like a horse. 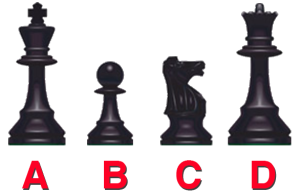 [q] Which piece is called a Pawn? [c] A [f] No, that is a King. Remember a Pawn is short and has a round top. [c*] B [f] Correct. Good Job! [c] C [f] No, that is a Knight. Remember a Pawn is short and has a round top. [c] D [f] No, that is a Queen. Remember a Pawn is short and has a round top. [q] Which piece is called a Queen? [c] A [f] No, that is a Rook. Remember a Queen has a crown on the top. [c*] B [f] Correct. Good Job! [c] C [f] No, that is a Bishop. Remember a Queen has a crown on the top. [c] D [f] No, that is a King. Remember a Queen has a crown on the top.